Peanut butter lovers, here’s the perfect grain free granola recipe for you! Packed with nuts and seeds, this low carb “cereal” contains crunchy peanut-flavoured clusters and is lightly sweetened with erythritol. It’s super easy to make and a healthy sugar free breakfast choice. Like peanut butter, granola AND want to stay low carb? 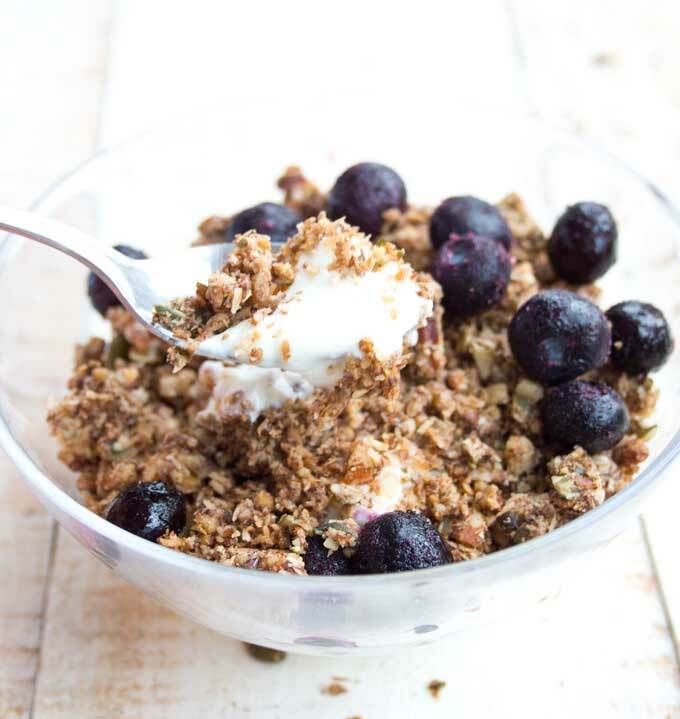 Then this grain free granola is the answer! I’ve been making homemade sugar free granola for years now. It takes half an hour to whip up a batch and you can store it for weeks. Even better, the whole family loves it. The main reason, of course, is that it is literally impossible to find a ready-made a breakfast granola that is grain free and low carb. If you go to the breakfast section of any supermarket, you’ll see it stacked with packets that essentially contain sugar. Even if you do come across grain free granola, these tend to be sweetened with copious amounts of honey and maple syrup. Others are brimming with dried fruit and raisins. They may be Paleo, but they definitely are not low carb. This peanut butter granola will give you an energy boost that will last until lunch without sending your insulin levels sky-high. It is packed with nutrient-dense nuts and seeds and contains a generous dollop of peanut butter. It’s so scrumptious I cannot wait for you to try it! 1.) 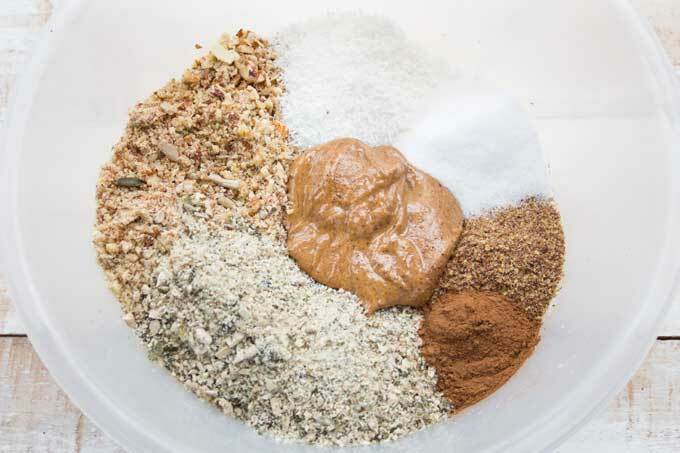 Pulse your nuts and seeds in a food processor until you have a mixture of smaller and larger pieces. You can use any nuts you like and / or have available. Then place all ingredients into a bowl. 2.) Mix with a spoon or a spatula until well-combined. The texture should be slightly moist, but not soggy. 3.) 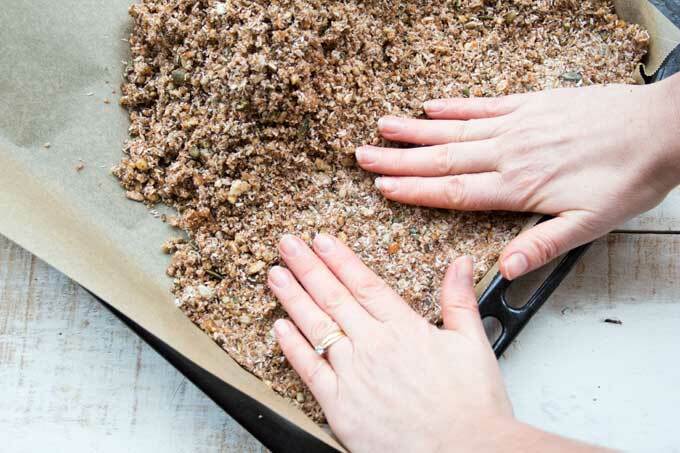 Press the granola mix firmly onto a baking tray lined with parchment paper. This creates the yummy crunchy clusters we want! 4.) Look at the clusters! This is how your brand spanking new sugar free granola looks when it’s fresh out of the oven. Let it cool and fill into an airtight container. Low carb breakfast is sorted! 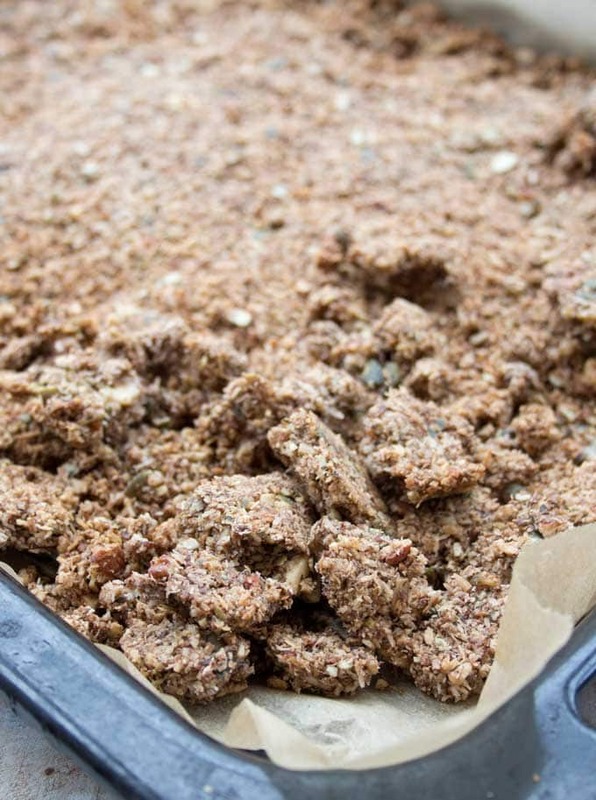 The ground flaxseed is essential for this granola recipe. Mixed with the water, it expands and helps to stick together the coconut, nuts and seeds. You could replace it with ground chia seeds. You can sub the desiccated coconut with coconut flakes. I have tried both and can’t decide which way I prefer. If you use desiccated coconut as per the recipe, make sure it’s unsweetened. A note about the oven time: This CAN vary. If you find the edges of the granola tray are browned, but the middle is still not crisp, you can break up the mix and move it around. The sweetener in the recipe is optional. I used regular granulated erythritol, but a brown sugar replacement would also be good here. One of my readers makes it with a pinch of salt instead of the sweetener! Looking for a taste variation? I imagine the granola would also taste good with pumpkin spice or mixed spice, cardamom or some cocoa powder. Maybe throw in some cacao nibs as well for good measure. If you want to up your protein levels, add a scoop of unflavoured protein powder. The recipe makes 12 portions of circa 50g each – around 1/3 cup. The nutrition is calculated for the granola only, without yogurt/milk/fruit. We like to eat our peanut butter keto granola with yogurt and berries or straight up with some almond milk. 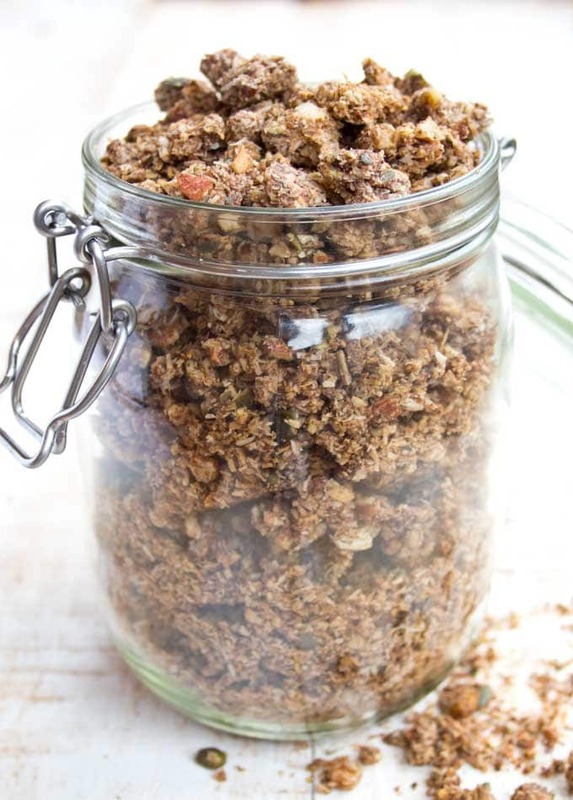 It’s also great as a grain free topping for crumbles. Or make some sugar free chocolate and add in the granola for a bit of crunch! If you love peanut butter you'll love this grain free granola. It has deliciously crunchy clusters and is low carb and sugar free. Preheat your oven to 150 Celsius / 300 Fahrenheit. 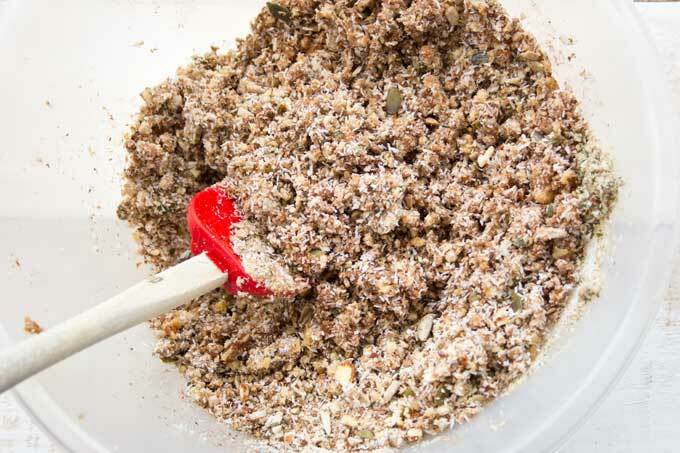 Pulse the nuts and seeds in a food processor until you have larger and smaller pieces. Spread the mix evenly on a baking sheet lined with parchment paper and press down firmly with your hands. Bake for 25-30 minutes or until browned evenly. Rotate the baking tray halfway through. Let cool to room temperature, then break into clusters. You can use any nut or seeds you like and/or have in your cupboard - I have substituted my mix with pecans, hazelnuts and sesame seeds. As a general guideline, I would say to use twice as many nuts as seeds. The flaxseed meal can be substituted with ground chia seeds. Do not leave it out - it absorbs the water and helps with the formation of clusters. If your granola is getting brown on the edges, but is not yet crunchy in the middle of the tray, break it into larger pieces and move it around a bit. The recipe makes 12 portions of circa 50g each - around 1/3 cup. The nutrition is calculated for the granola only, without yogurt/milk/fruit. The post Grain Free Peanut Butter Granola was first published in December 2015. It was updated in January 2019 with new images, more how-to tips and a recipe change to reflect how we make this granola today. Can’t wait to try this.. I’ve always loved granola. Yummmm. Also.. is yoghurt allowed on Keto? Hi Nicky, of course you can have yoghurt. Keto is about keeping your carbs low and your fat levels high. I’d choose a full fat Greek yoghurt. This looks amazing. I miss any cereal on keto. Please can you tell me the Fat in your nutrition guide as I need to track fat on keto. Thanks! I’ve added it in now, thank you for letting me know. It’s 24g per portion. Great recipe, Katrin! I can’t wait to try this out. 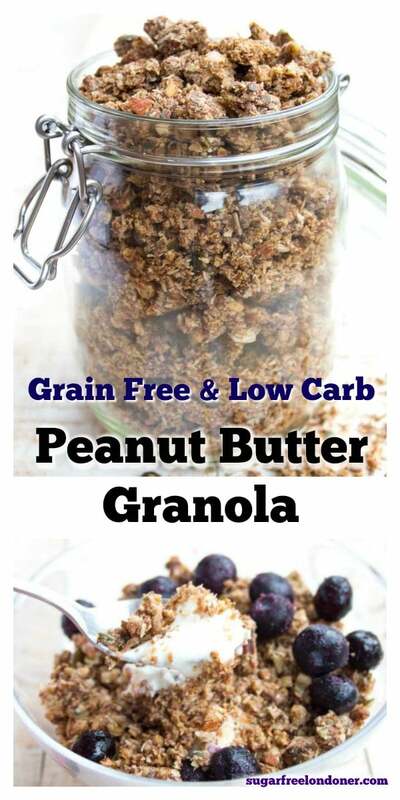 Peanut butter is such a great and versatile ingredient and I think nutty granolas are just the best. I think I would serve this granola with strawberries and banana for some extra natural sweetness, and maybe some almond milk! I have it in a large mason jar on the kitchen counter. Depending on whether I make a single or double batch it lasts between 1 and 3 weeks. It stays crunchy! Loving the recipes. Can I ask – do you activate your nuts and seeds first before making the granola? This is great! Because it’s so rich, you can’t eat the same quantity as a normal cereal. I tried it sprinkled on natural yoghurt but I found the yoghurt flavour dominated so I couldn’t really taste the delicious slightly salty nuttiness. Next time I might bulk it out with some oats as you suggested, probably with more peanut butter to bind it together. Do you think coconut oil would work too? I wanted to bake it for longer but the small seeds and coconut were starting to burn. I’d like to have more clusters and fewer crumbly bits. Glad you like it. Coconut oil would work well, too. I found that moving the mixture around a bit during baking helped – in my oven stuff browns quicker when it’s at the back. I’ve read that adding a bit of water makes the mix stick better, so you could try that. It would make ingredients like ground flaxseed expand, so I see how that could work. Oats, too, if you’d like to add them. I had the same experience you had with cinnamon pops with supermarket granola. Yes, now I know that it is actually the sugar that makes the crumbles stick together! First much later I understood how unhealthy this type of breakfast was. But I aslo still have a craving for the crunchiness of granola type mueslis. So I will try this out to crunch and spice up my usually quite drab oatmeal porridge morning routine. I hope you’ll like it! I’m having a bit of a peanut butter phase at the moment, but of course this recipe works with any other nut butter.